How it looks if someone is speaking our language with entirely different pronunciation. His speech will be unacceptable and rather funny. It is very much important that you should use right pronunciation otherwise it seems quite ridiculous and bizarre. This is the short pronunciation guide for all the users who visit our site. There are 46 sounds in English comprised upon 24 consonants and 22 vowel sounds. Vowels and consonants are not actually letters they are sounds and it is important to know the difference between vowels and consonant sounds. First of all you must know what the vocal tract is. Both nasal and oral cavity are called vocal tract, and it is the vocal tract which is the origin of every utterance. Some sounds like /m/ and /n/ etc are uttered from nasal cavity whereas others like, /t/ and /d/ are uttered from the oral cavity. /t/ is pronounced by touching tip of the tongue with teeth ridge (alveolar ridge). /b/ is pronounced by meeting two lips. /g/ is pronounced by touching the back of the tongue with soft palate. 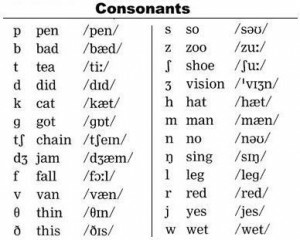 Now see the chart of consonant sounds below. In the first column there is a sound and the second column contains the words with that sounds whereas in third column there is complete transcription of the words in second column so that you must know where the sound of first column occurs. See the chart of the vowel sounds. Any sound that contains the diacritic, a symbol like colon /:/ has a different phonetic value. The vowels with diacritic are long vowels whereas others are uttered quickly and called short vowels. There are also two vowel sound joined together such are called diphthongs. There maybe three vowels as well which are called triphthongs. Triphthongs are not mentioned in the chart below. Correct pronunciation is the vital and one of the most important aspects in language. In the pronunciation guide we shall guide you stepwise about all English sounds that once you go through you will learn all that is needed to let you pronounce anything the way it ought to be, and the way English people speak. So keep in touch and read all pronunciation chapters.